I started playing Fallout New Vegas after Fallout 4 came out. I tend to play older games because I can’t justify spending $50-60 on a new game. I also wanted to finish the story in case someone bought me Fallout 4 as a Christmas gift. If you haven’t picked the game up at some point with one sale or anther I recommend it. I have put about 30 hours into the game and I don’t think I am done yet. 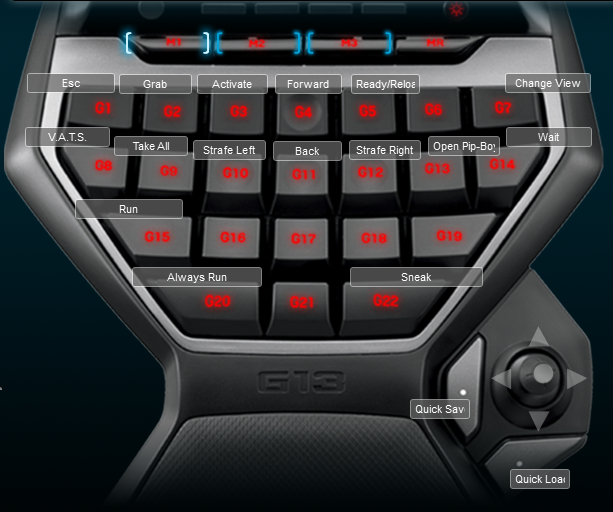 I created a Logitech G13 profile because the default one that you find is less than useless. Below is the image of the keyboard layout as the mouse just attaches melee and jump to my mouse keys as I do with almost all video games these days.